The Flatirons Tuning Rally Team wins Production GT amongst strongest field so far in the 2007 Rally American National Championship to move into the championship lead. 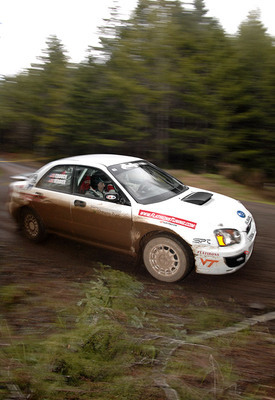 The Flatirons Tuning Rally Team secured their bid for the 2007 Rally American Production GT National Championship with their second straight win of the 2007 season. With 2006 Champion Matthew Johnson returning to competition after a crash at the 100 Acre Wood Rally that destroyed his competition vehicle, as well as fast regionally based competitors Canadian Norm LeBlanc and Washington based Jamie Thomas adding to a full field of the Rally American National Championship regulars the Oregon Trail Rally saw the most competitive field to date. "Oregon was going to be a very important rally for us from the very beginning. After shaking the car down at 100 Acre Wood and not really getting a good chance to measure ourselves against Matt [Johnson] we weren't really sure how we'd do. I know how to drive on these roads from when I ran my own Production GT car and we made some key improvements to the car but we still needed to see how we would do against Matt since he will probably be the driver we will have to beat for the championship." Stated Flatirons Tuning driver Stephan Verdier when asked about the importance of the event. 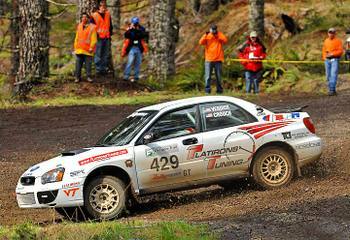 Adding to the challenging nature of the Oregon Trail Rally was a series of spectator stages held a Portland International Raceway on Friday night, making Oregon Trail the only 3 day rally on the calendar and presenting teams with an important strategy challenge. "The stages at PIR are tricky, you can't really win the rally here, but you can lose it, we saw 3 of the high budget Open class teams blow motors and drop out of the rally before we ever hit the first real stage of the rally. Matt [Johnson] came out charging hard and looked to be taking big risks, we wanted to play it safe and try to get into rally mode and get adapted to our new suspension. We lost more time then we wanted to but it was important to make sure we didn't damage the car when the real stages begin. We planned to go out and push on Saturday and try to make up time and maybe pressure Matt into making a mistake so we could close the gap." 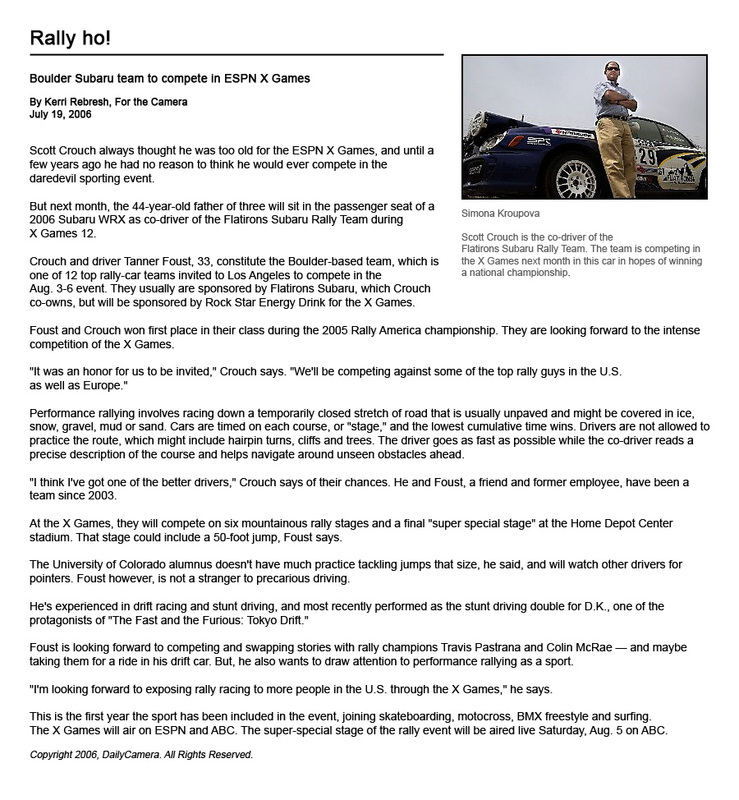 Noted co-driver Scott Crouch while commenting on the team's strategy for the rally. Leg Two of the rally started with the Flatirons Tuning Rally Team taking the Production GT stage win on the first stage of the morning by 6 seconds over Johnson. On Special Stage 8 the Flatirons Tuning Team kept the pressure up and took the stage wins on five of the six stages to take the overall lead in Production GT. "On Saturday I was really pushing the car and trying to attack while not taking too many risks. We were able to beat Matt on the first stage which was important for us," said Verdier. Sunday saw the teams tackle just four stages to make up the third and final leg of the rally. Again the Flatirons Tuning Rally Team was on the attack as they ended up taking Production GT stage wins on 3 of the 4 stages to finish the rally with an almost 2 minute lead. "We had a couple of minor mechanical issues with the differentials sometimes putting us into front wheel drive but I don't think it effected our times very much. It was too bad that Matt [Johnson] broke his transmission on Saturday and wasn't able to battle with us. I feel confident that if we can do better on the starts of rallies though that we can compete for the championship with Matt even though we have only gone head to head on one stage with both cars running at 100%. We will take the car back to the shop and get the differentials worked out and continue to develop the car towards maximum specification and hopefully we can once again battle for a class-win next month at the Olympus Rally." Stated Verdier after the podium celebration in Hillsboro, OR. Stephan Verdier, of Long Beach, CA, is a former top Production GT championship contender and has taken two overall rally wins to date in his rallying career. In addition to his duties as the driver for the Flatirons Tuning Rally Team, Verider also competes in the Formula D Drifting series where he will debut a new rear wheel drive Subaru WRX STi as well as participating in a variety of Time Attack races. Along with his Motorsports exploits, Verider is a former French National Downhill Skiing competitor as well as former 2 times Winter X Games Skier Cross competitor. Scott Crouch is the General Manager of Flatirons Imports in Boulder, CO, home to the largest Subaru Dealership in the Rocky Mountain region. Scott has been co-driving for over three years and won the 2005 Rally-America Production GT National Co-Driver Championship as well as was on one of the first 12 teams to compete for Rally Gold at the ESPN X Games in 2006. Scott is the proud father of three children and is supported by his wife Libby. The Flatirons Tuning Rally Team is supported by Flatirons Tuning, a performance shop for Subarus, Mitsubishis, and Hondas, based in Boulder, CO. The Flatirons Tuning team is also supported by BPM Sports ( http://www.BPMsportsusa.com), a top Subaru tuning company based in Australia, COBB Tuning (http://www.COBBtuning.com), one of the top Subaru tuners in the United States, Tire Centers International, a nationwide tire chain with over 100 commercial centers nation wide, and Prodrive, a Subaru performance and rally parts supplier. http://www.rankingtuning.com the best tuning and formula 1 site... check it out byeee!! !